When we woke up this morning, the thermometer showed that it was 39°F (3.9°C). Not 39°F outside, friends. That was the temperature INSIDE our bedroom. Brrr…. 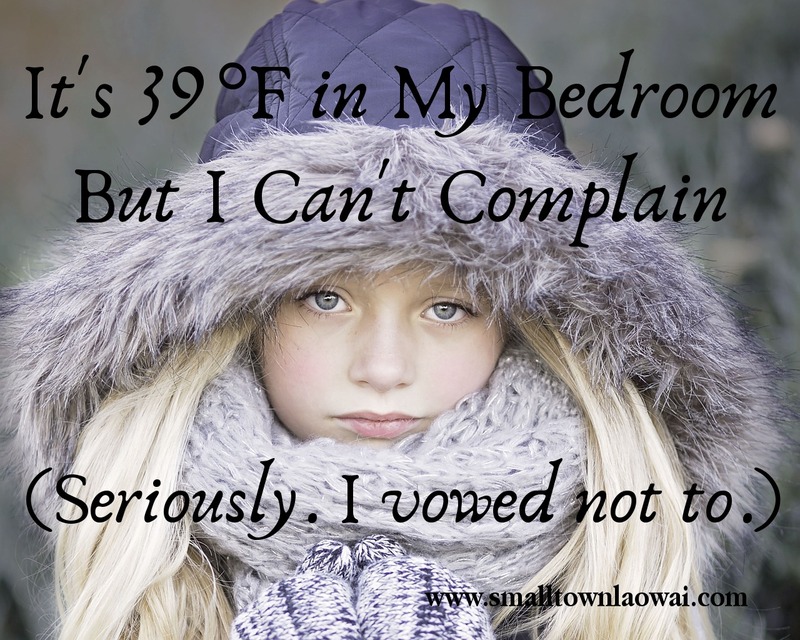 But I am not going to complain about how frigid it is because…I promised not to. This all started nearly two decades ago, when I spent several weeks in Changsha, Hunan, which is one of the infamous furnaces of China. And you know what? I’ve mostly kept that promise over the years. Actually, my vow is fairly easy to keep for a couple of reasons. For one thing, I spend my life in warm climates. For much of the year, I’m hot. Therefore, there aren’t many chances to feel cold, let alone to start complaining about icy temps. So, when it’s 39°F outside, it’s also 39°F inside. And the heat is whisked out of you by the damp air, so that even when you are in your house, all bundled up like that kid from A Christmas Story, you feel chilly and can never quite get warm enough. Bonus for the curious: look up chilblains. I had never even heard of them before coming to Guangxi, but I know them now. But I have to stop myself. I remember my vow, and keep my mouth shut. (That also helps preserve heat, right?) I remember how hot and sweaty I’ll be in a few more months, and I change my tune. I try to enjoy all this cold because it won’t last. Come early May, I’ll be wishing I was shivering instead of sweating. This is one of several posts I wrote a couple of years ago but never got around to posting. It gets colder where we currently live than it did in Guangxi, but it’s a much drier climate so we have escaped the misery of wet-cold, at least for now. No matter where you are, may you have a warm and cozy December! I remember how cold it was in Jan 2008 in your apartment in Nanning, and how quickly I figured out why you kept rubber clogs by the bathroom door when my feet clad in wool socks slid me into the splits as I attempted to use your Chinese “squatty potty”!!!!! Holy chilblains – yes, we got them in China as well. Yikes. We feel very cold as well in a large stone house, but 3C sounds very rough. Awesome perspective. And awesome blog! Thanks so much! It was definitely a challenge, but I still like the cold better than the heat. Looks like you are not in Kunmin, I’ve heard the weather there is really nice. I grew up in a town in northwest of China which gets very very cold in winter. The average temperature is around -20°C outside (yes, Celsius and below zero), but fortunately we have heater inside almost everywhere and the climate is very dry. Then I went to college in Chengdu, Sichuan, I thought I could handle the winter there, oh boy I was so wrong. Just like Guangxi, even though it is 10°C outside and inside, the humidity makes it so much worse and I can feel the coldness just penetrates through multiple layers of my clothes. And I got frost-bite on my foot in the first year, which never happened in my life even though my hometown is so much colder. But now when I look back those years, they are so valuable memories and stories for my kids. I agree. Cold is one thing, but humid cold is much worse! Oh god…I guess I am just an incorrigible moaner 😀 I complain both about the hear and the cold 😀 But I complain about the cold more…Winters are miserable even here, in the very south of China – Shenzhen and Hong Kong. In Shenzhen I remember having to run TWO heaters at the same time in my bedroom in February and still waking up in the middle of the night, because I was shivering. It was a nightmare! And it wasn’t even 4C as was in your case, but more like 10C. I honestly don’t know how you did it in 4C – I think I’d simply get sick (which I did a couple of winters when it was exceptionally cold in Jan-Feb, just about 2 degrees above zero). Don’t worry, Victoria, *you* never vowed not to complain! 🙂 Guangxi is very similar in climate to Hong Kong and Shenzhen. It’s the humidity that does one in, I think. Thank goodness for AC and hot water bottles! Very good point about the smaller apartments being easier to heat. And man, those HK apartments are very small.